But what if YOU’RE the bully??? For the past couple weeks I’ve been discussing the serious topic of bullying. Bullying is not a harmless act that should be brushed off. 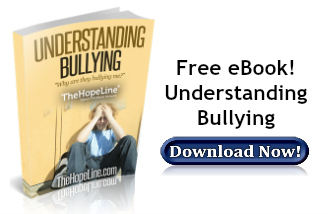 Bullying has very real emotional and psychological effects that can last a victim’s lifetime. Depression, anxiety, heightened feelings of sadness or loneliness are all issues that may persist into adulthood. But what if YOU are the bully??? Believe it or not, there are long-term effects to being a bully as well. Those who bully others may partake in other negative behaviors well into adulthood. Bullies are more likely to abuse drugs and alcohol, get into physical fights, drop out of school, vandalize property, have criminal records, and even be abusive to their romantic partners, spouses, and even their own children as adults. Does hurting other people or taking their things make you feel better? Do you avoid thinking of how your hurtful words and actions may make someone else feel? Have you been bullied before and now feel like you have to make up for it by bullying others? If you’re bigger, stronger, and/or smarter than others your age do you use this fact to get your way or manipulate others? Have you purposefully tried to make someone, even a friend, feel bad? Say you’re sorry to those you’ve bullied and follow it up by being friendly to them. They probably won’t trust you right away, but sooner or later they will see you’re for real. Bullies often have low self-esteem themselves which is why it’s important to explore ways to boost your self-esteem. Find a new hobby, volunteer, get involved with a sport or in a group. If you’re feeling like you’re having trouble controlling your feelings, such as anger, talk to someone. Your parents, a school counselor or teacher, or a friend. Also remember that if you are being bullied yourself, responding with force and aggression is not the best way to end the cycle. Bullying a bully is still bullying. Next week, I will address some methods on how to respond to bullies. I want to hear from you about bullying. Tell me your thoughts and questions on my facebook page. Thanks for this post. Really true!!!! Cukrxyca, thank you for your feedback on our posts. I will share it with the team.